The installation process of the footing of your arena can be a long headache. Let’s clear up the precise steps of the process and all of the components of each step so that you will have no questions, and hopefully can clear up that headache. It will be all worth it after your first ride on your brand new arena. Eventually surfaces will wear and the need to replace will become a necessity. At this point you have to figure out how to go about removing and disposing of old footing. The first thing to do before you start pulling your old footing up is to make sure that you have somewhere to dispose of it. It is helpful to calculate the amount of material you anticipate removing. A simple calculation would be the average depth (D) in feet (e.g. 3 in = .25 ft) multiplied by your arena dimensions in ft (width [W] and length [L]). This will give you cubic feet and if you divide that by 27 you will arrive at the number of cubic yards of footing that will be removed. Once you know how much material will be removed your options will be dictated by space availability and the type of material you are removing. 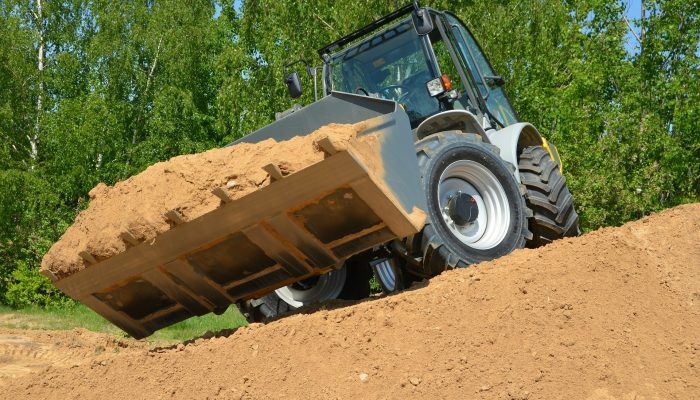 If your existing surface is a sand or dirt footing it can spread it across some land, used or sold it as fill, or keep piled up somewhere on your property for later use. If you happen to have a kind of footing with additives in it such as fiber, rubber or a kind of coating, it is not recommended to simply leave it on your lawn. Local DEC agencies should be able to point you toward regulations on disposal of such material in your area. Recommendations and regulations can vary greatly throughout the country. Most synthetic footings are not considered hazardous and be easily disposed of. When a plan is a place for dispose of your footing, you are now ready to start the extraction process. This process is fairly simple for a skilled equipment operator, but an untrained operator can cause a wide assortment of otherwise avoidable issues. These issues primarily have to do with disturbing an otherwise sound base. To begin use a skidsteer to pile up sections of footing to be removed then, if possible, use larger machinery, such as a tractor or payloader, to transport it out of your arena. It is advised to proceed slowly by peeling back thin layer of footing rather than digging deeply in one spot. Keeping your bucket as level to the surface as possible will limit the amount of “diving” that may send the bucket scraping along and damaging your base. When you are extracting the old footing be sure to avoid damaging the base in the process. Bases can consist of everything from undisturbed native soil to an intricate layering of differing size stones with soil separation fabrics. Given the importance of the base to the consistency and longevity of your arena surface, caution when digging at the lower levels of the arena is advised. A little extra care and time can save a lot of time, money, and headaches down the road. Be sure to read all of the information in the Base Section! Be sure to read all of the information in the Drainage Section! Installing your footing correctly is one of the most important steps in arena construction and can help to avoid many common arena footing issues in the future. Depending on where you purchase your footing, specific installation instructions or installation videos may need to be followed. But for all footing work from the far end of the arena to the near and avoid driving on the footing as much as possible until the arena footing install is complete. When spreading your footing, use a laser level or measuring stick and measure regularly throughout the arena footing installation process to be sure that your footing is at the correct depth. The use of a laser level skidsteer is a great option during this process, but does require a skilled operator to use effectively. Measure, check, and measure again. The consistency of the arena footing will be impacted by variations in the depth of the footing so evenness at this stage is vitally important. Once the arena is spread consistently some footing may require it to be rolled with a heavy powered roller, refer to your suppliers recommended installation instructions to be clear about requirements of your footing choice. Rollers are used to “set the base” of the footing. This will provide some added stability to the footing and softness can be obtained by harrowing only the top surface. A more in depth explanation of maintenance is covered in another section of this website. Delivery can often be the biggest hassle when it comes to building your arena. Footing is mostly logistics. There are going to be lots of various trucks coming to your facility during your building process. Between delivery cost, options for delivery, Truck restrictions, etc, there is a lot about delivery to know. Cost for footing delivery can be a major expense depending on what footing you are purchasing. If you are purchasing sand, you will need to get the sand sent from the nearest sand pit after you have inspected it and decided that it is the correct sand structure and type. (Link to sand section) This will be relatively cheap. If you are purchasing footing that is a premixed type that comes from a specific place, you could be living across the country from that specific mixing site. Be sure to converse with your contractor or where you are purchasing your footing so you know exactly where it is coming from and how much shipping will cost to get it there. Delivery for footing or your materials for your base can be a big hassle. Footing can be delivered in a few different ways. The first way is that the footing company ships all of the different components of the footing to your facility and mixes it there on site. A second way is the footing is pre-mixed at a different site and shipped to you in either bulk bags, which can weigh almost 2,000 pounds, or bulk shipment. Shipping in bags is normally used when you are further away from the site that it is mixed in and bulk is used for closer shipments. You can have anywhere from a few trucks delivering these to almost 14 depending on how big your arena is! A third option is train shipments. Using trains can be the cheapest route when footing is shipped across the country. A container would be brought to the mixing site of the footing, where it would then be transported to a railroad station, trained to the nearest location to the destination, then a tractor trailer would retrieve the container and dump it at the final destination. When setting up the shipping process it is important to let the company who you are working with know if you’ve had problems with trucks reaching your house or location before. If you live on a dead end, or in a cul-de-sac you need to let them know because these could be considered trucking restrictions.